Doesn’t seem to have been posted on April 1, must be serious! I finally have a tactical reason to shoot in my bathroom!!!! WoooHOO!! Thanks DPC!! They should mount high power blowdryers around the circumference of the target so that crosswinds can be simulated. @Hatchetman Yes, and a lawn sprinkler and snow cone machine to simulate adverse weather. When I first saw this a bit back I assumed it was a joke. Not that it has been posted here with Todd’s blessing I see I was wrong. 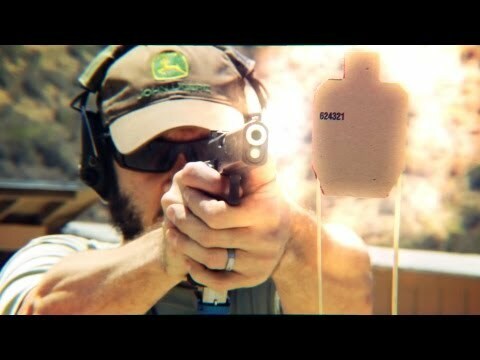 I attended a class where they taught that you only needed to shoot at no more than 5 yards, on smaller and smaller targets to learn how to shoot at longer distances. I was skeptical of the claim as distance multiplies the movements at the muzzle. So, I challenged the instructor who had a female student shooting 1″ groups at 5 yards to have her shoot at a 25 yard target. According to his claim, she should have all center mass hits with no problem. She shot 5 rounds and missed 3. Wouldn’t the set up of your sights make a difference? Set up for center hold at 15 yards would put them off at shorter and longer distances wouldn’t it?